I remember this cake well. It was made for every kind of occasion. From birthdays to anniversary’s to showers to Christenings to First Communions, Confirmations and all kind of church functions. 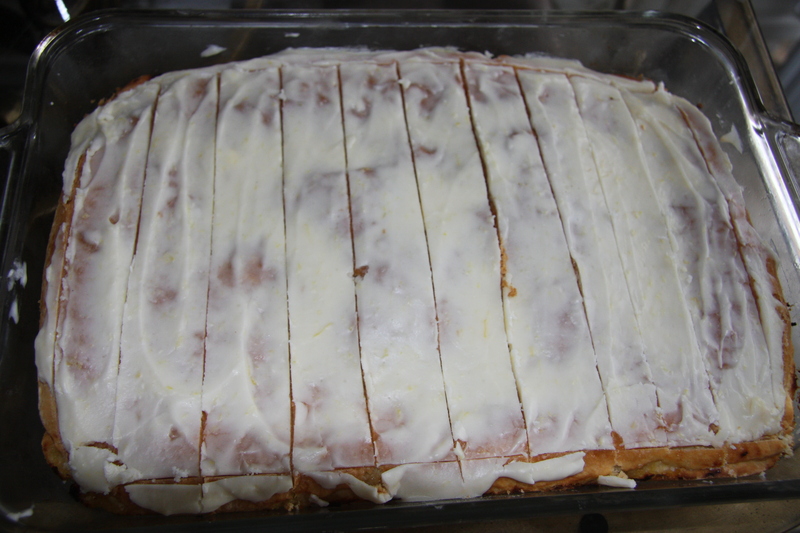 It made a lot and looked great on trays with all the other cakes. It is funny because I was asking my friend the other day about this cake, though she didn’t make it she knew about it because her aunt makes it to. 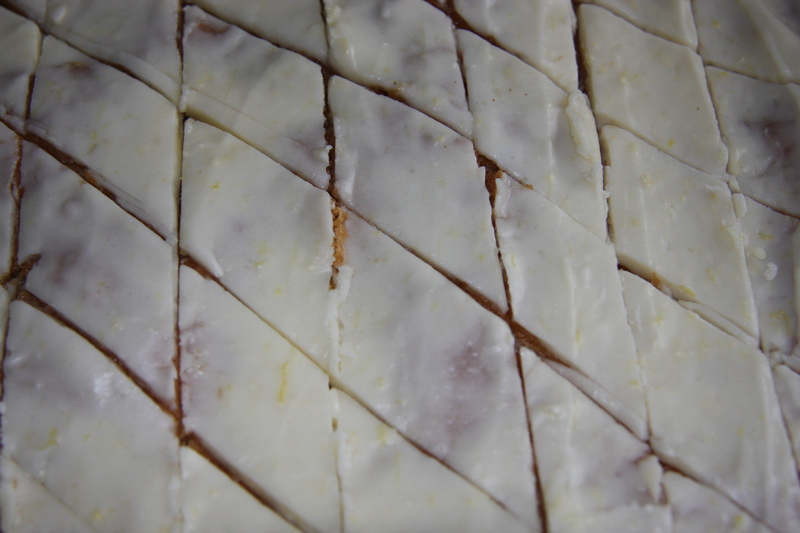 It is not a hard cake to make and it is easy to put together. I haven’t made it in years so I was feeling my way through because there were things I had forgotten about. 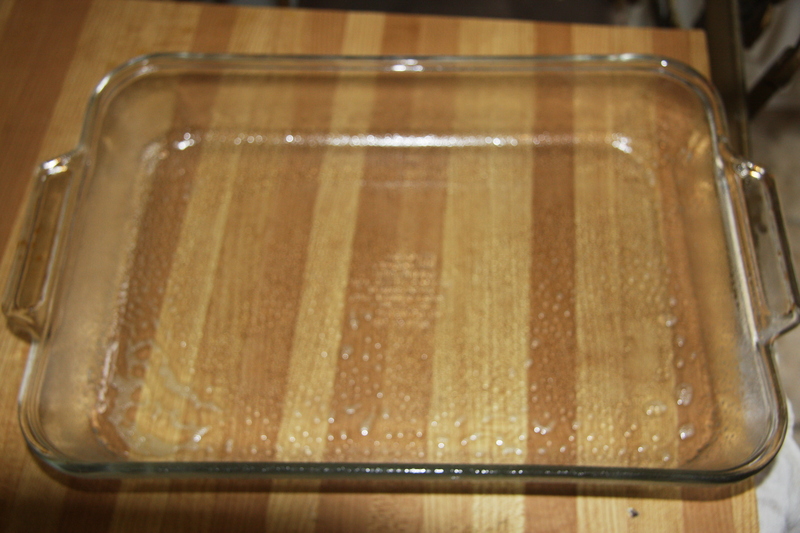 Grease a 9×13 inch pan. Mine was a bit larger, so it you have one use it, your cake won’t be as high but still good. 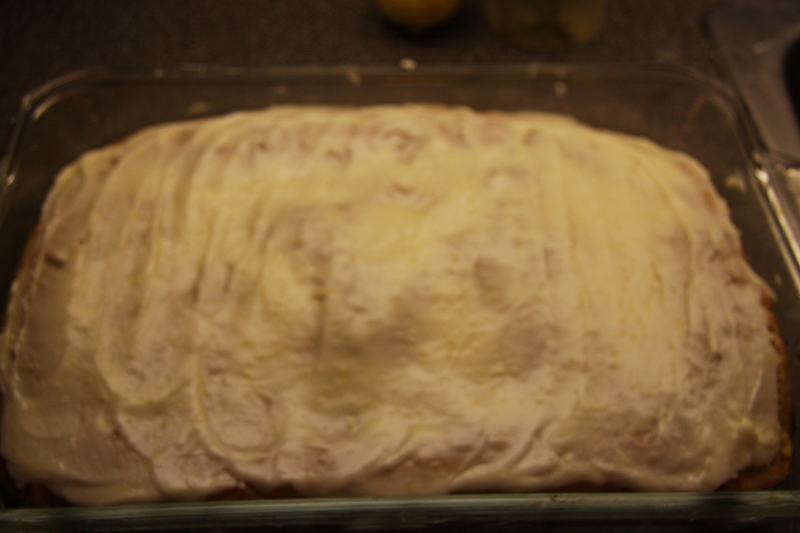 I like to make the filling first and set it aside to cool. 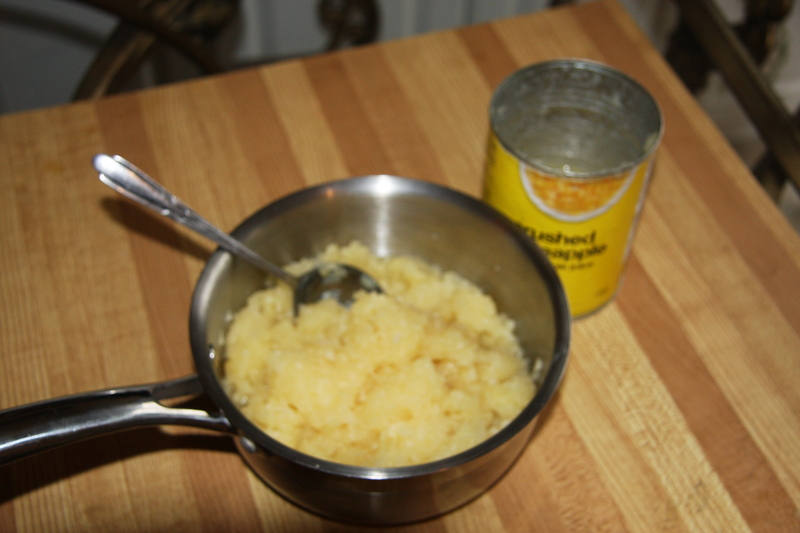 First empty out 2-19 oz cans of crushed pineapple into a pot. 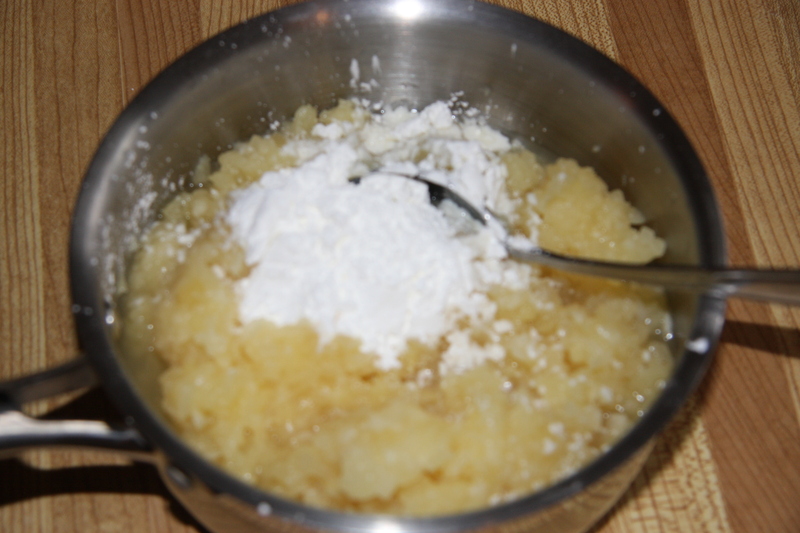 Add approximately 1/4 cup of cornstarch and about 1/2 cup sugar. The sugar depends on how sweet you want it. Just give is a taste and you’ll know. Mix all off the ingredients together and cook over a medium heat until thickened. Set aside. To me this is the trickiest part. Pay close attention to what I am about to tell you. 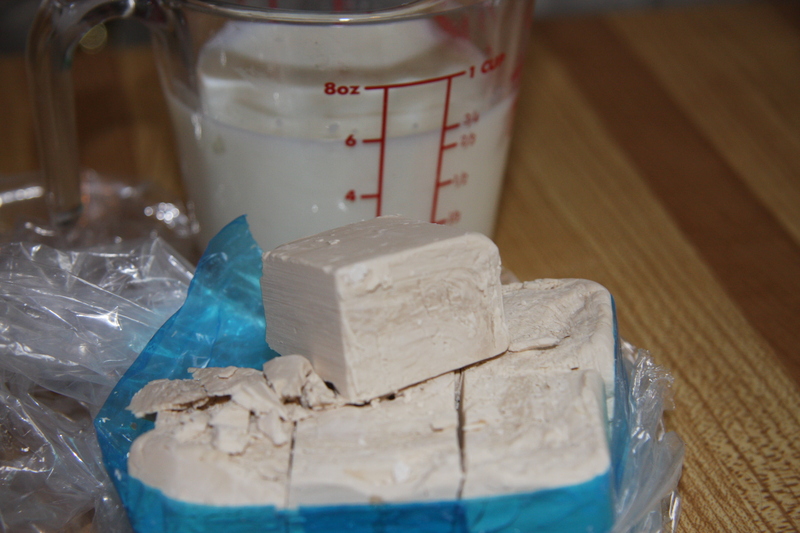 You must use 1 cake of yeast but not the one you buy individually packaged in the dairy section of your supermarket. Go the the bakery department and ask to buy a cake of their yeast. They might tell you the other stuff is the same but it is NOT, NOT as fresh and might not give you the same results. Now I have to buy this yeast 1/4 lb. 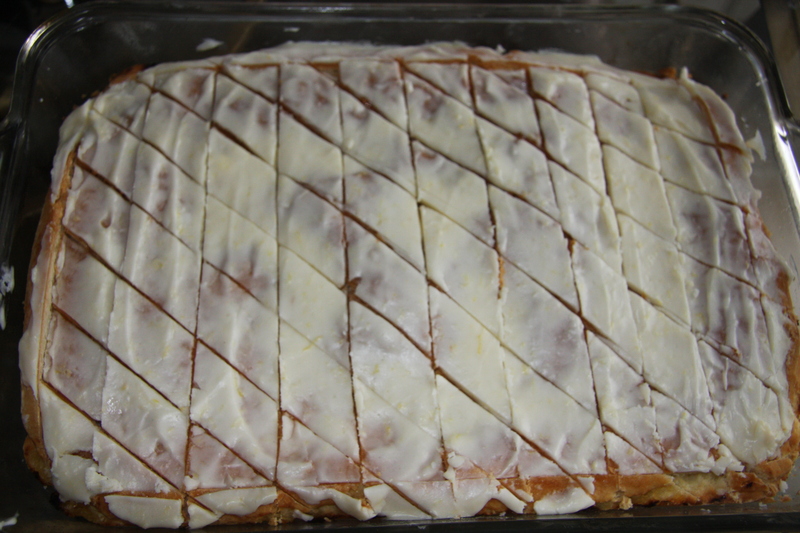 at a time, but that’s ok. All you do is cut it into cubes, wrap it individually in foil and put it in the freezer. It will keep for about 6-8 months. Use it in other baking or make pizza dough with it. It is the best cake yeast I have ever used. If your supermarket doesn’t have it then try a bakery. 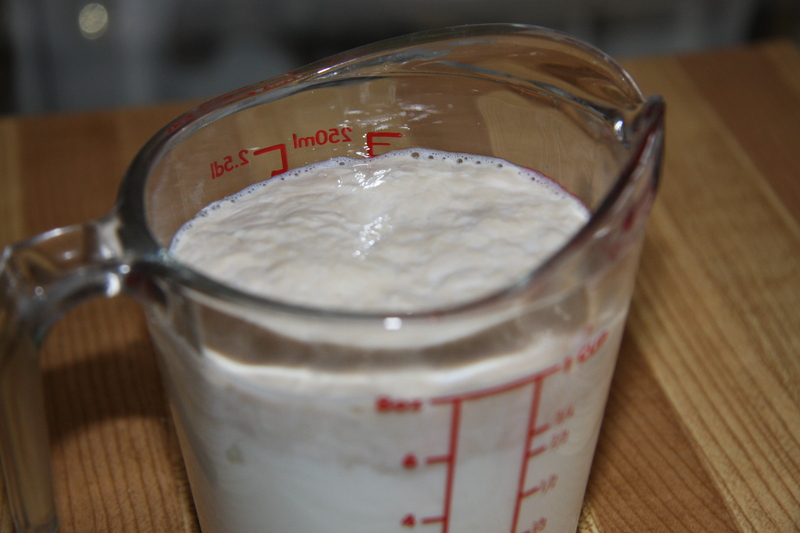 Into preheated milk with a couple of teaspoons of sugar, crumble the yeast, cover and let it bubble. This process does not take long if it fresh yeast. 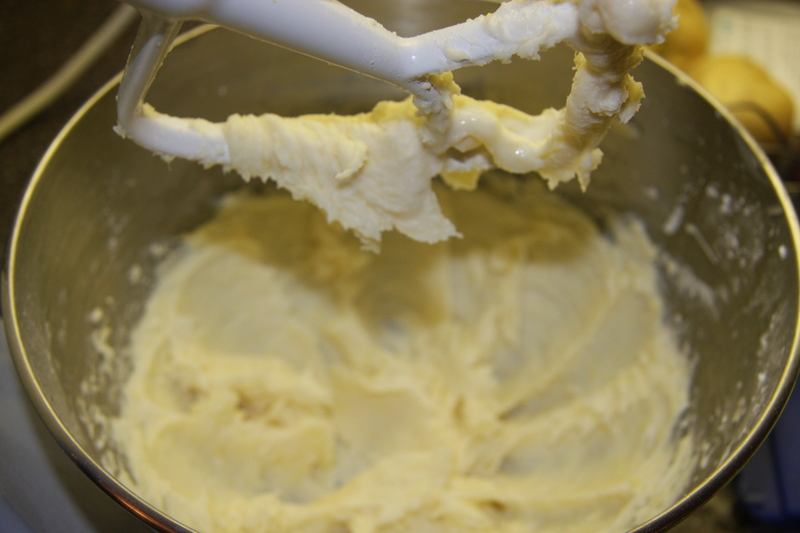 In a mix master bowl add 3 cups of flour and 1 cup of butter. Combine together until you see little crumbs. 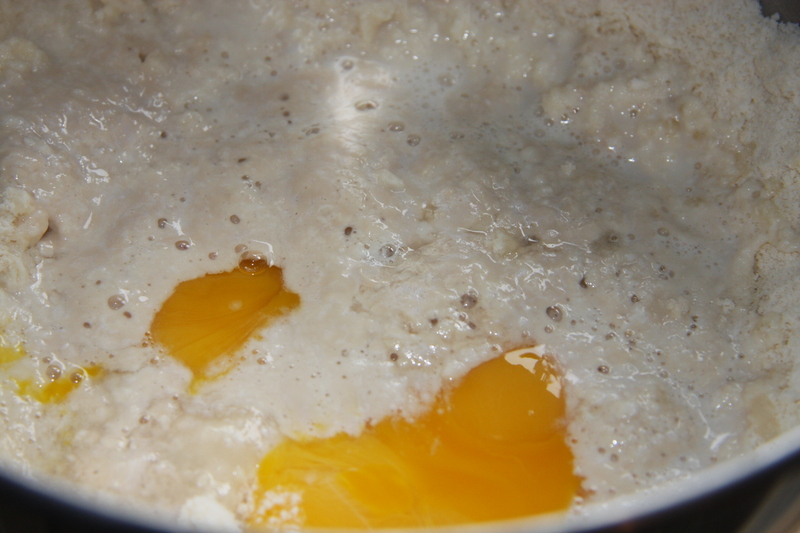 Then add your yeast, 3 egg yolks and 1 tablespoon of sugar. I used a dough hook and combined the ingredients together. The dough will be firm but a bit sticky. 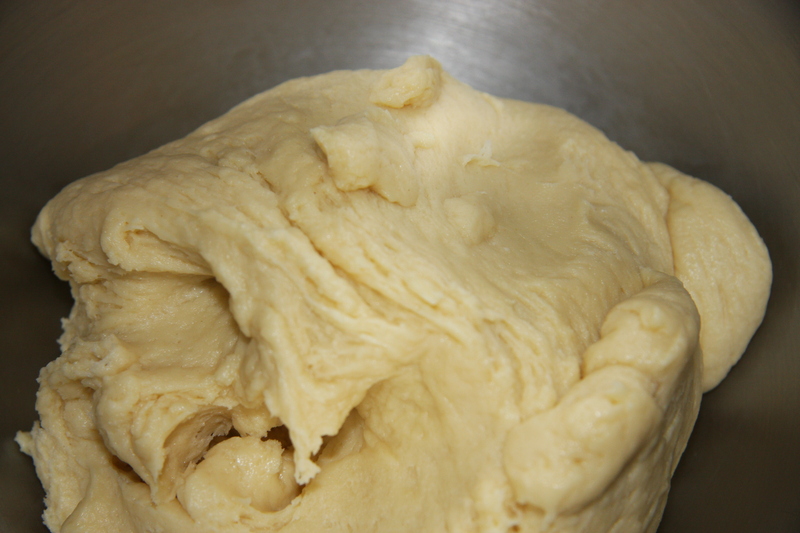 Divide the dough in half, roll it out to fit the pan. Top the bottom layer with the cooled pineapple. Roll out the other half of the dough and place on top of the pineapple, tucking in the edges. Cover it with a dish towel and let rise in a warm place for 1 1/2 – 2 hours or until doubled in size. Place into a preheated 350 degree oven for approximately 30 minutes or until golden. All ovens are not the same so keep an eye on it. Cool. 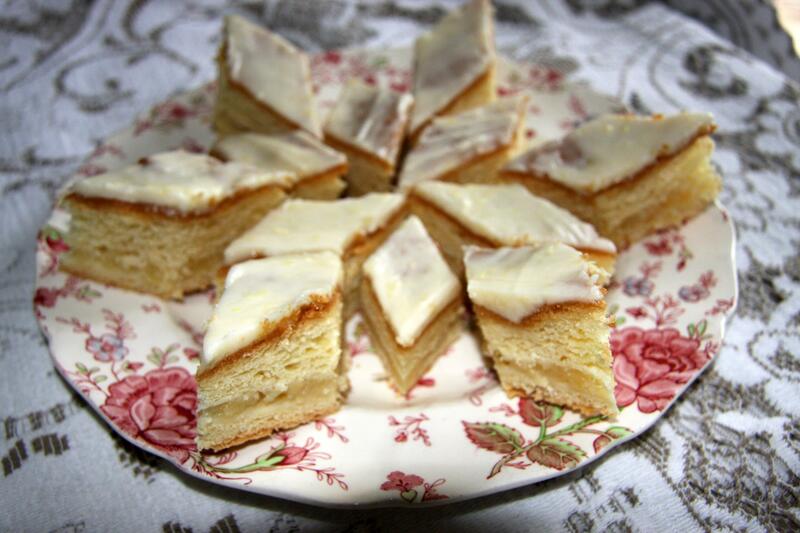 While cake is cooling, into a bowl add 4 tablespoons of butter along with 2 cups of icing sugar, combine. 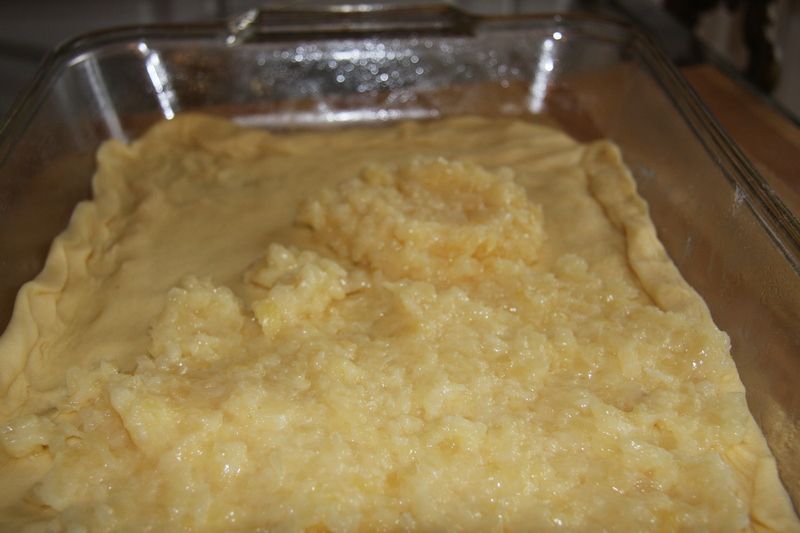 Add 3 tablespoons of milk, pinch of salt, 1 teaspoon of fresh lemon juice, and grated lemon rind. Mix until well combined. 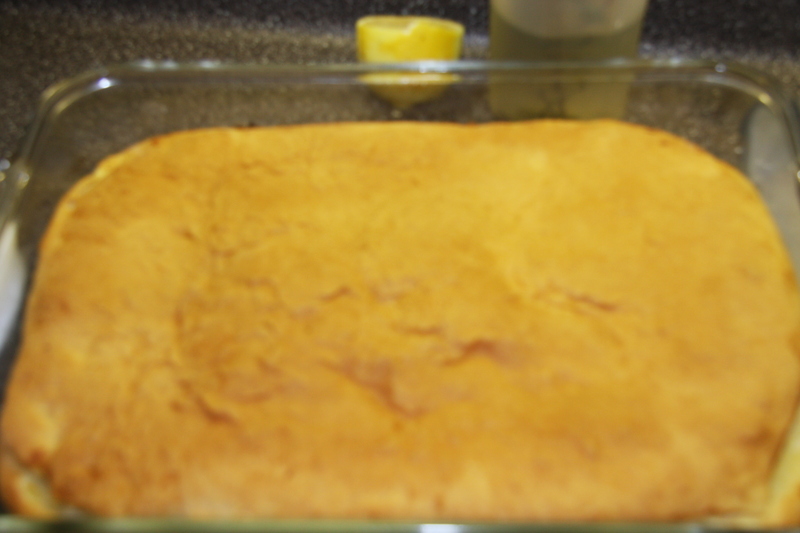 This was the original recipe for the icing but for my size of pan I found it wasn’t enough. So next time I would double the recipe. Told you I haven’t made this in years. On top of the icing you could sprinkle ground walnuts. I place the cake into the fridge so it is easier to cut. Then I cut along the outside to make sure edges are nice and even. Next I cut across the cake. Then on a diagonal. This way I have diamond shape pieces. They look so nice on a platter. Make sure you cut with a hot wet knife. This is not a sweet cake. If you want to add extra sugar into the pineapple then feel free to do so. Drain pineapple, place into pot with sugar and cornstarch. Cook until thickened. Set aside to cool. Cream butter and sugar. Add milk and grated lemon rind and lemon juice. Beat until smooth. 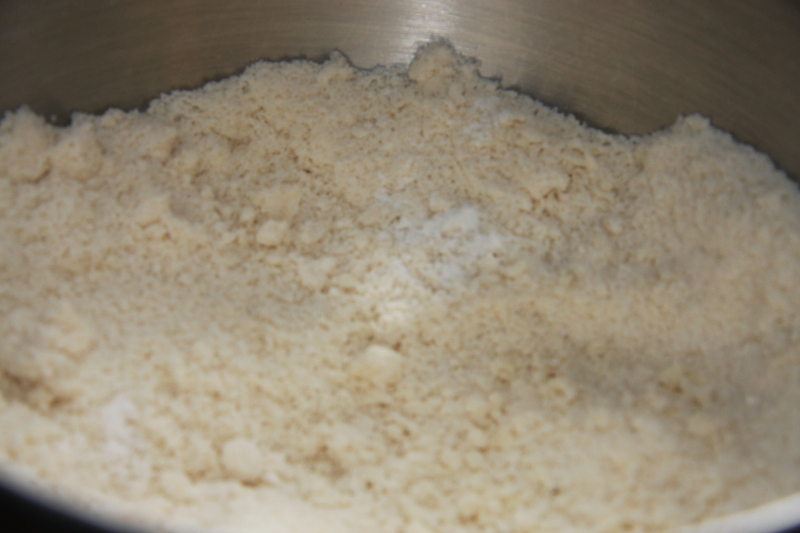 Warm milk, add crumbled cake yeast and cover. Set aside until it bubbles. Add the yeast to 3 cups of flour along with egg yolks and sugar. Beat with a dough hook until the bowl comes clean. It will be a bit sticky so when handling use a bit of flour. 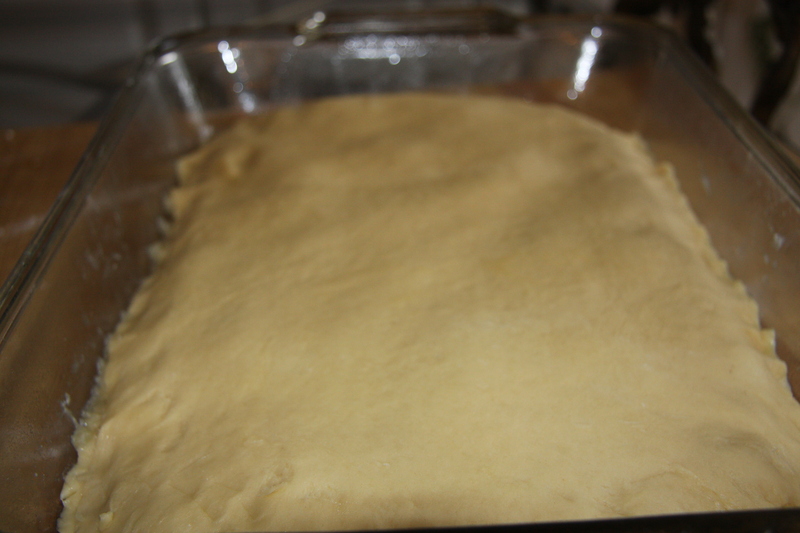 Spray your pan, divide dough in half and roll out dough to fit the bottom of the pan. Place your cooled pineapple on top. Roll out the remaining dough place on top of the pineapple and press down edges. Cover with a dish towel, place in a warm place until doubled in bulk. Anywhere from 1 1/2 – 2 hours. Place into a preheated 350 degree oven for approximately 30 minutes or until golden. Cool and ice. This also freezes well in a container with a lid. Have fun making this. Enjoy! Another one for my recipes box.